Whiteheads, small, firm bumps that appear on the skin, are caused when the pores are clogged with oil. Although whiteheads and blackheads are similar, whiteheads are closed, so the oil is trapped under the skin where it hardens and is unable to escape. Usually, whiteheads can be controlled with simple self-care methods, but be persistent and patient, as it may be up to six weeks before you notice a marked improvement. See your physician if your whiteheads don't improve in six to eight weeks. Wash your face twice every day, using a gentle, non-detergent cleanser. 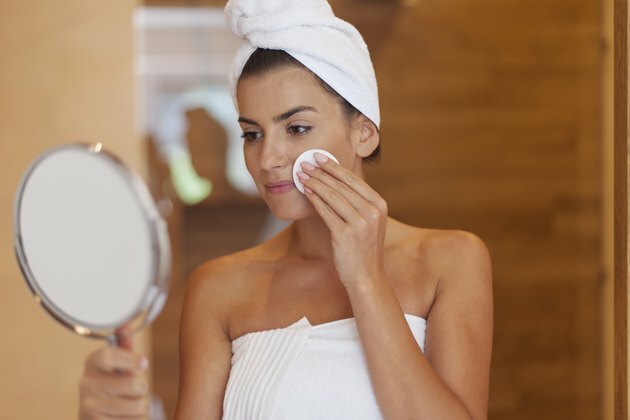 Avoid scrubbing, which can irritate the skin and make whiteheads worse. Remove whiteheads with a gentle exfoliating product once every week. Use a commercial scrub or make your own by mixing 1 tsp. baking soda with enough water to form a paste. Massage the scrub gently into the problem areas, then rinse with warm water. Apply an over-the-counter medication containing benzoyl peroxide, resorcinol, or salicylic acid. Benzoyl peroxide will kill bacteria and prohibit the production of oil. Salicylic acid and resorcinol will break down whiteheads and blackheads. Start with the lowest concentration possible, as stronger concentrations can sometimes irritate the skin. Use a stainless steel comedone remover to remove large whiteheads. Steam your face first to open your pores. Bring a saucepan full of water to a simmer. Drape a large bath towel over your head to create a tent, and then lean over the steaming pan for six to eight minutes. Stand in front of a mirror and place the comedone remover over the whitehead. Press gently to remove the whitehead, then dab the area with rubbing alcohol to remove bacteria from the open pore. Use oil-free skin products, hair products and make-up. Oil will clog the pores, making existing whiteheads worse and creating new whiteheads.